Call Centre Fairytale, our new musical play, which mixes the grey soulless realism of the call centre with the razzle-dazzle fantasy world of Strictly, swung in to action on Friday July 27th at Nottingham Playhouse, as part of Write Pride. A twenty minute extract from this new work, which explores LGBT themes and workplace bullying, was performed in the Neville Studio at Nottingham Playhouse as part of Write Pride. Afterwards, we took part in a great question and answer session with the audience. We even got to watch the other performers and enjoy their brilliant work. 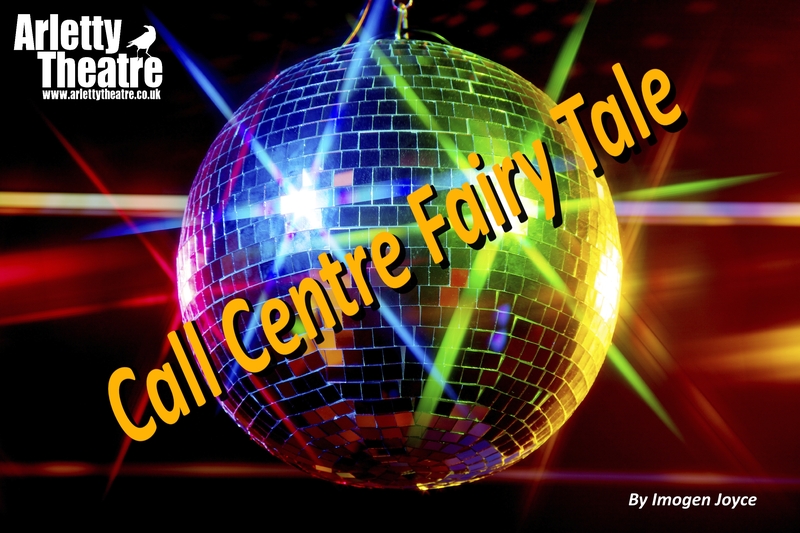 We’re delighted that Call Centre Fairytale was chosen to be part of this fabulous event, and welcome actors Andrea Crewe, Aimee Berwick, Sarah Carleton and Kieran Hardcastle to Arletty Central! We started eagerly developing the script with these lovely actors the weekend before Write Pride. They’ve given some fascinating insights in to the plot and characters – and they’re wonderful singers too! Thanks to the scratch cast, and Hayley, Tom, Katie and James, who worked on this fantastic event. 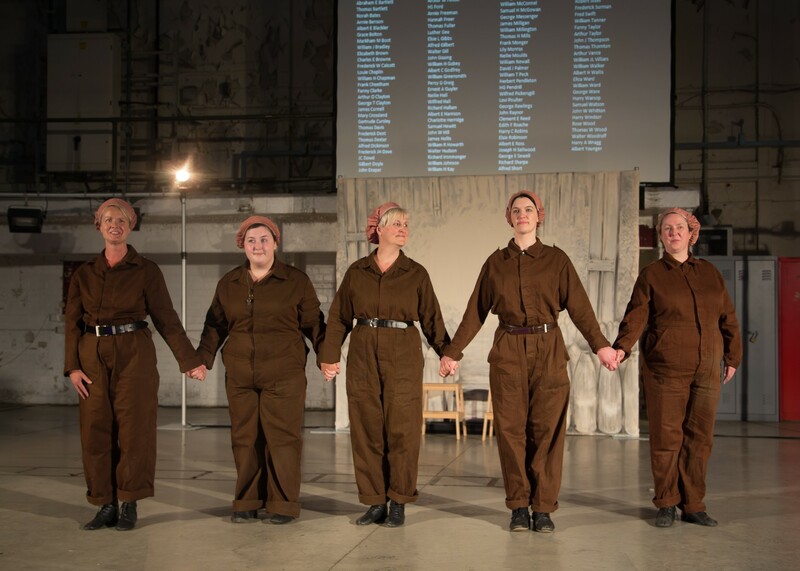 Swan Canaries, our play about the Chilwell explosion being performed on the original site of National Shell-Filling Factory Number 6, Chilwell, now known as Chetwynd Barracks, June 29th 2018. Please note, we are unable to read unsolicited scripts. This is a very small company, with most administrative roles covered by two people, so we’re sorry, but it isn’t possible to respond to work sent on the off-chance. We currently have projects in the pipeline. Do you have dates yet for Patchwork Lives? I couldn’t get to see it in the summer, so am hoping to make it this autumn! We’re just in the process of booking venues, and looking at dates from the middle of October onwards, so we’ll let everyone know in plenty of time. Lovely to hear from you. Your story is the first one performed in the “Patchwork Lives”, so it’ll be great to see what you think. Meanwhile, keep an eye out for our new musical piece “Saving Declan Clare”. It looks as if its going to be a very exciting piece. Thanks for the information. I shall be away for 2 separate weeks in October, so fingers crossed that I can make one of your venues! When I have the dates I’ll pass them along, as several members of the group weren’t able to make the previous dates and are interested. Sat Nov 16th, Quenilborough Village Hall. Great. Thanks for letting me know. I have noted them down and will pass on to the group. Hi. I saw “Swan Canaries” at the Lowdham Book Festival and want to take a group of WI ladies to see it, as I thought it was wonderful. We can’t, though, make it to any of the venues this year. Do you have 2015 dates / venues organised yet? Or – how much would you charge us to come to Shelford, near Radcliffe on Trent? Our hall only holds 70 people and I reckon we could fill it if we spread the word – publicity was completely absent in Radcliffe last week! Thank you for getting in touch. I’m delighted that you enjoyed ‘Swan Canaries’ so much. We would love to bring the production to Shelford: we are very keen to tour to small communities. We usually charge a fee of £500 to smaller venues. Let me know how this sounds, as there are other possible alternatives, if you are able to promote the show to your local audience.